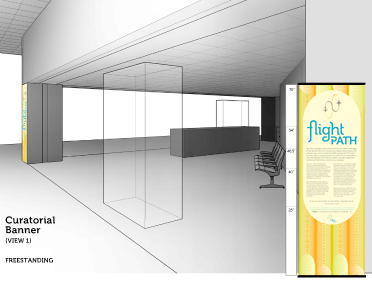 In 3 weeks, design a visual identity for the Flight Path project, along with environmental signage for its art & education exhibit in the Seattle-Tacoma International Airport. 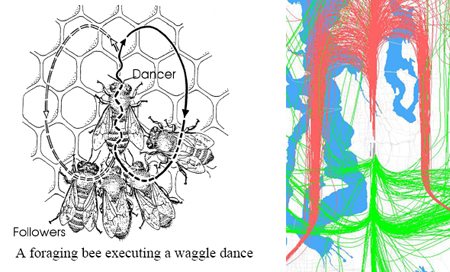 In my research about bees, I discovered a diagram showing the path a bee makes when communicate to other bees where pollen can be found. Further research revealed that the paths planes follow in and out of Sea-Tac Airport create similar shapes. 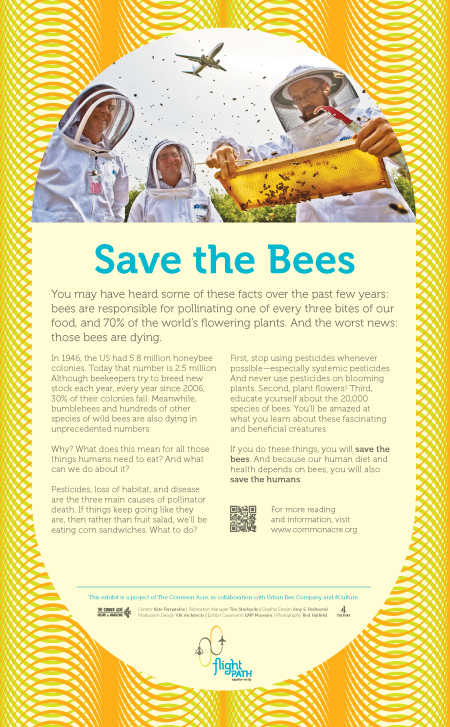 In trying to tell the story of how bees & humans are connected, this became a great source of inspiration for both the logo and the exhibition signage. 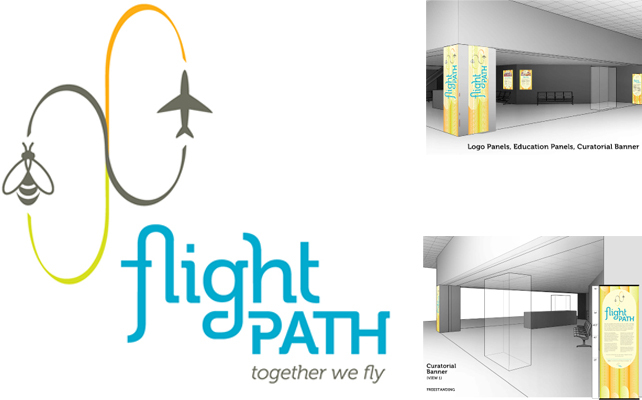 The following pages, below, are my early sketches for the Flight Path logo. Bees see many colors differently than we do; for example, orange looks like green to them. Blue, however, appears the same to both of us. 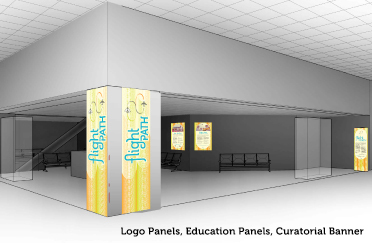 These facts first informed the color choices for the exhibit signage. After playing with it for awhile I solidified some ideas, applied them to the logo, and then went back and updated the signage. That’s not the usual way to develop a logo, but with a 3-week timeline it was necessary to allow some back-and-forth in the design process. 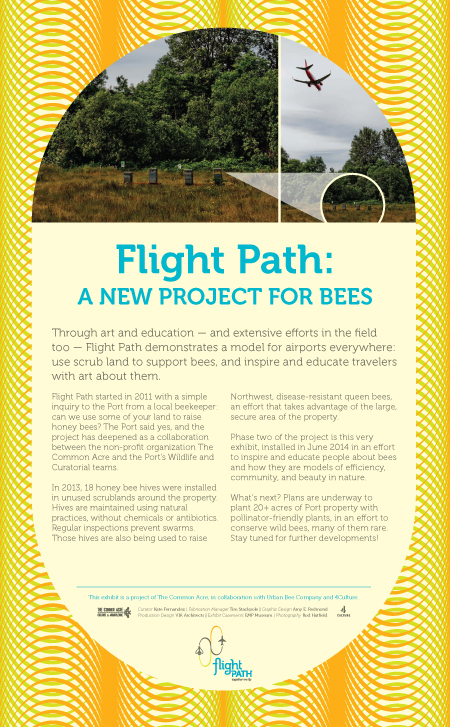 Flight Path is a project of The Common Acre, with support from the Port of Seattle, Urban Bee Company and 4Culture. 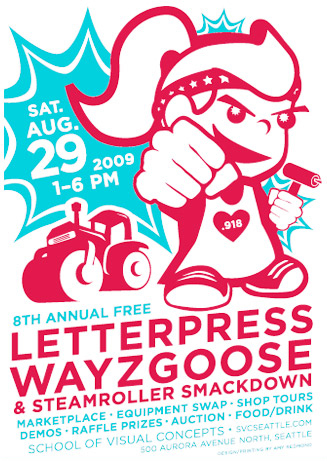 Thanks is also due to all Kickstarter contributors, who helped get this project off the ground.